LINCOLN PARK — Instead of heading to South Beach for the summer, the man who performed the most scrutinized knee repair surgery in recent history headed to Kenya to help some African athletes. Lincoln Park resident Dr. Brian Cole, the Bulls team doctor who performed the surgery on Derrick Rose's torn ACL, packed 15 duffel bags with about $750,000 in medical equipment in early June and headed to Africa. "They have tons of rugby and soccer players, and they have all the same injuries that we have," Cole said. "They just have to live with it, and are done forever." 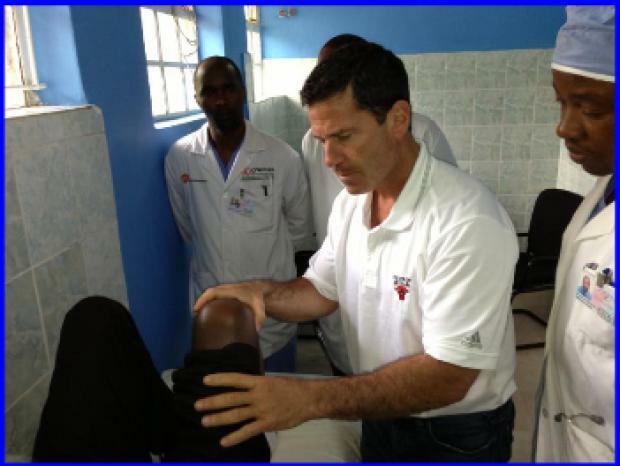 Once word got out that Cole, who is also the team physician for the White Sox, was coming to Kenya, patients who had gone years without repairing sports injuries began signing up for treatment. Since the days of Michael Jordan, the Bulls have had an international presence, and most of the doctors and patients he worked with in Kenya knew about the Rose surgery, according to Cole. Along with the medical supplies, Cole packed 50 Bulls caps. "I felt like we gave half of Kenya a Bulls hat," he said. In a week, Cole performed about 15 arthroscopic surgeries, but more importantly, taught the doctors at a local hospital how to perform the surgeries and gave them the tools to do so. Each day, Cole led a different set of lectures at the Kijabe Cure Children’s Hospital. They started with the basics of arthroscopy and moved on to knee arthroscopic anatomy, knee pathology, shoulder pathology and even knot-tying. Cole said he realized that there were bigger issues in Kenya than sports injuries, but wanted to help where he could. "Look, you aren't going to die of an ACL tear," he said, but added that the injuries keep some people from working and providing for their families. Cole planned the trip about a year in advance and gathered supplies from Rush University Medical Center that would normally be thrown away. He also accepted donations. Cole, his 14-year-old son, and a physician's assistant brought camera lenses, pump systems, scrapers, pins, drills, sutures, textbooks and lectures on tape so the Kenyan doctors could revisit their lessons. A typical ACL screw could cost a hospital about $100 or $120, and an arthroscopic scraper that a U.S. hospital would be forced to toss could cost $100, according to Cole. "The waste that we have in our system is just enormous," Cole said. "It's like using a Gillette razor blade for half a shave when you can use it for 10 shaves." All those extra shaves headed to Kenya, and the thousands of dollars in supplies blew the doctors away, according to Cole. "The guys I was training were really good surgeons. They are front-line surgeons and technically very good, but hadn't done a lot of arthroscopy," he said. "Holding a camera and doing an arthroscopy is kind of like a video game." Cole likens the procedure to a pilot who knows how to fly a Cessna taking the controls of a commercial jet. When Cole makes the return trip next year the only change he plans on making is bringing his wife along. "It was life-changing for me," he said. "It was refreshing."